Can we do something for the wounded world? as well for the timeline of mother earth. that you are unlocking, are as well released for others. You are invited to embrace the spirit of eternity that causes birth, life, death and rebirth. as well for your self, as for all and everything that surrounds you. Are you ready to celebrate the beauty and the wisdom that have been part of your Life through time immemorial? Are you craving some retreat time? Are your creative juices ready for some sacred play? Join me in the natural beauty of the Presentation Center to journey on your personal timeline, the mysterious link to your history connecting you to the ancient past and to the fullness of the future. 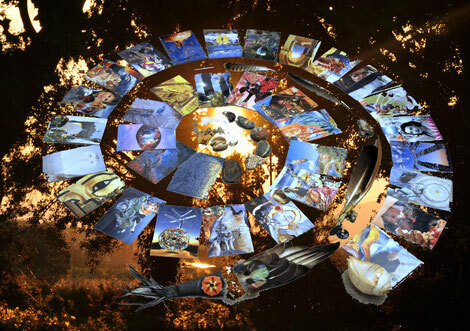 By exploring and consulting our SoulCollage® Cards in the context of your life-path, you will gather and harvest all the beauty, comfort, care, love and sacredness that grace your life. Using the language of mother Nature as a metaphor, the answers will evolve organically through your cards. Sensing meditation, dance and guided breathing will be helpful tools to receive information directly into your heart. Journaling, creating SoulCollage® Cards and Landart in the surroundings will be the creative ways to express and integrate our insights. This work is a joyful boost of energy, that has a strong and longlasting effect. In the Presentation Center in Los Gatos we find an ideal and precious space. The charming light of its surroundings invites us to connect with our inner light and allows us to freely be the jewel that we are. 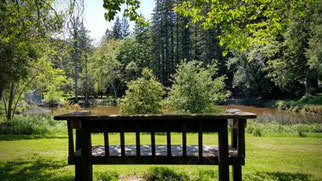 This serene Center in the Santa Cruz mountains is a 67 acre piece of land with beautiful oak woodlands, a pond, and redwood trees. It affords ample opportunities for walking and spending time in nature.